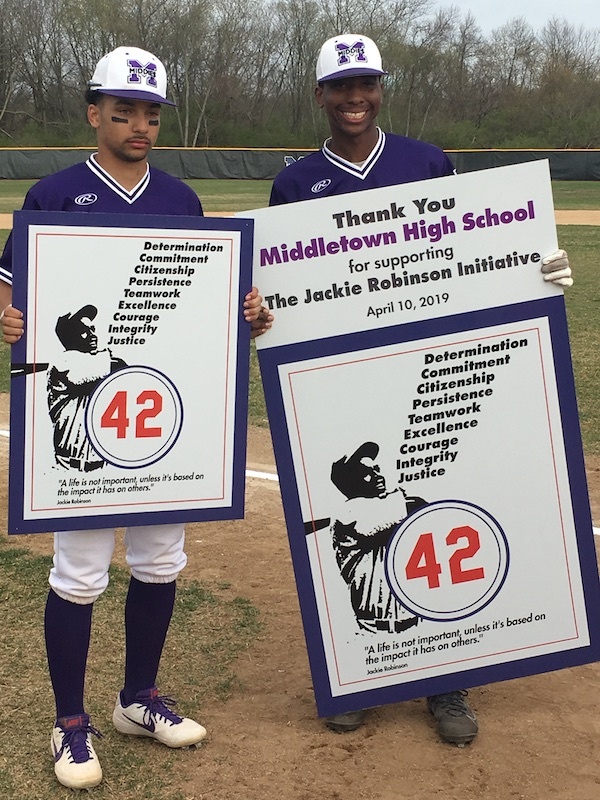 MIDDLETOWN, Ohio (WKRC) - Jackie Robinson changed baseball when he broke the color barrier, but he's also remembered for his strong character. Students at local high schools are honoring his legacy in a special way, and they want this movement to go nationwide. This idea started with Marlon Styles. He's a recruiter for the Reds. In baseball, the number 42 means a whole lot. It's Robinson's jersey number. Robinson was the first African-American to break into Major League Baseball. Styles went to his friend Kim Nuxhall with the Joe Nuxhall Foundation and said MLB retired Jackie Robinson's jersey in 1997; high schools should have the honor of doing the same thing. Fairfield and Middletown are the first to receive the honor. "It means a lot. I can't really explain it. It just means so much to me," said Jarren Thomas from Middletown High School. Thomas is a senior. He's had a love for baseball since he could start walking. Playing on junior league teams, he was usually the only African-American player. "Playing against other people, racial slurs have been said to me, but I watched the movie 42 -- his movie. He taught me to get past all that and just play baseball," Thomas said. Robinson's legacy has touched many lives and will continue to inspire the future generations. Nuxhall says Thomas' story is why he thinks it's important to remember Robinson. "Something that touches their heart to inspire them to do something. Those are the leaders we need. I hope this initiative isn't about just hanging a sign on a backstop or going to a Reds game. It's something much deeper. That is our hope -- that it impacts these kids," Nuxhall said. Nuxhall knows the importance of reaching children early. It's the reason his foundation is donating the plaques that will be placed on the backstops. "Hopefully this will inspire kids to think about what Jackie did and continue his legacy of being a role model and striving to be a better person," he said. The hope is to retire 42, not only in the Tri-State, but throughout the country. The Reds also donated game tickets to both teams.